Authentic Sambar or what I call 'Sambar From Scratch' is also known as "Arachuvitta Sambar" which literally means sambar with freshly ground spices. As one can probably imagine, there is no substitute for freshly ground flavor. I grew up eating this kind of sambar since the 'simple sambar' using sambar powder was unheard of in those days. Most people make the simple sambar nowadays only because it is quicker to make when one is on a tight schedule. It really does not take too much extra time to prepare the freshly ground spices - absolutely worth the extra effort - to quote Paji: "now this is the real thing"! Traditionally, Toor dal, a skinless yellow split bean, is used to make sambar; but any kind of split and skinless legumes such as yellow split peas, masoor dal (red lentils), and the yellow, split Mung dal may be used. Moringa pods, regular or pearl (small) onions, summer and winter squashes (gourds and pumpkins), regular or sweet potatoes, taro root (arbi - Colocasia esculenta), eggplant, green beans, radishes, etc may be used alone or in any combination to make a delicious sambar. Sort, wash, and cook the toor dal in water to cover until very soft and creamy. Check tamarind pulp (if using) for seeds and pieces of shell and discard them; soak in 1/2 cup of hot water. While the dal is cooking, roast the spices: in a small pan heat the oil. Add the chana dal, the seeds, chilies, pepper, and the lump of asafoetida if using. Stir and cook until the dal is golden. Remove from heat and stir in the powdered asafoetida if you are not using the lump type. Cool. Grind the roasted spices with the tamarind and the coconut into a smooth puree using a blender. Set aside. Prepare vegetables of your choice into 1" chunks; cook them with the turmeric and salt until tender. Mix the ground spice mix into the vegetables and bring to a boil. Stir in the cooked dal and bring to a boil again stirring often. Remove from heat. Prepare the thalippu: Heat the ghee/oil with the mustard seeds and chili. When the mustard seeds pop, remove from heat and add the crushed curry leaves carefully. Stir for a few seconds and pour the whole thing into the sambar. Garnish with coarsely chopped fresh cilantro/coriander leaves. Serve hot with hot steamed rice or roti and veggie side dishes such as Cabbage Thoran, Raita, etc and/or fried or toasted papadoms. Plantains and bananas are a delicious way to add fiber to our diet as both are great sources of fiber. Although typically Podimas is one recipe where turmeric is not a traditional ingredient, it can be added if preferred. I generally do not add turmeric to podimas as we use it in the most of the other recipes regularly. Plantains and unripe bananas are available in Mexican/Latino markets as well as Indian markets. Green plantains and bananas are a bit dry and starchy and hence will benefit from steaming over or cooking in water. They need plenty of moisture to bloom the starch in them. Cut the plantains/bananas into 2 or 3 chunks; cook in their own jackets (skins) until soft. Let cool. When cold, peel, and grate coarsely. Prepare thalippu in a kadai (Indian wok) or a skillet: heat the oil with mustard seeds, dal, and the chili. When the mustard seeds finish popping, add asafoetida if using and the curry leaves. Stir in the bananas with the salt and cook until heated through over low heat. Add coconut and mix well and heat for another couple of minutes. Serve hot with rice/roti, and Rasam/sambar, raita, and papadams. 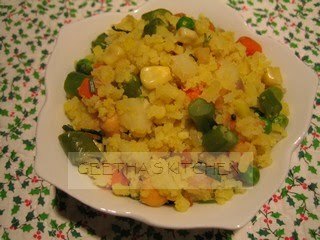 Aval Upma with Potatoes also known as Aloo or Bataata Powa in Mumbai area is a delicious meal in itself. It can serve as a healthy breakfast, lunch or a teatime snack in the afternoons. It is an important dish that is a must at special occasions in some parts of India. I often make it for our weekend brunch. Thick aval/poha is best for making this dish (thin is a bit too brittle and crumbly but will work just the same if that's what's available - "bird" in hand!). Aval (Tamil/Malayalam) or Poha (Hindi) is rice flakes or flattened rice similar to rolled oats. It is available in Indian markets under the name of thick or thin Poha; I generally use the thick poha or aval for this dish. Place the aval in a bowl and add plenty of water; pour off all the 'floaters' - bits of husk. Drain well and add 1 cup of fresh water and let soak while you prepare the rest. Wash all the fresh veggies well and drain. Cut the potatoes and carrots into cubes about the size of marbles. Cut the hot green chilies in half and remove the seeds and the whitish membranes with a teaspoon and discard; chop the chilies finely. Heat the oil in a large skillet or seasoned kadai (Indian wok) and add the mustard seeds, chana dal, and urad dal. When the mustard seeds finish popping, add the asafoetida. Immediately stir in curry leaves, green chilies, ginger, and onions with a couple of pinches of salt and turmeric. Cook stirring until onions are translucent. Stir in carrots and potatoes with a little salt and cook until they are tender. Stir in corn and peas and cook for about 5 minutes. Add the soaked aval and stir gently but thoroughly to mix well. Cover and cook over low heat until hot stirring occasionally. Remove from heat and sprinkle with the lime juice and cilantro; mix well. Garnish with the whole cilantro leaves and serve hot, warm or at room temperature by itself or with tomato chutney or any of your favorite chutneys. Beets and their greens are delicious as well as nutritious. They are packed full of minerals and cancer-fighting pigments. Beets are such showy veggies with their wonderful color! I like to include them in our meals as often as I can. Here is one pretty simple but delicious way to eat them. Enjoy Beets Thoran as a side dish with any meal! The mustard seeds and the split legumes in the thalippu/tadka add a delicious toasty flavor and a mild nutty crunch to the thoran in addition to giving the dish a protein boost even though it is a small one; every little bit ultimately contributes to the total nutrient count of the whole meal! Wash the beets and their leaves well; drain. Cut off the leaves with their stems. Chop the stems finely and chop the leaves coarsely. Lightly peel the beets if they are big; if small peeling is not necessary. Chop finely or shred the beets. In a skillet or a wok heat oil and prepare thalippu with the seeds, dal, etc. When the dal turns pinkish, add the curry leaves, chopped beets, and stems and leaves. Stir in the salt and cook covered for about 10 minutes stirring occasionally to prevent sticking and scorching. While the beets are cooking, coarsely grind the cumin seeds, red chili, and coconut together. When the beets are tender, add the coconut mixture to the beets and cook until heated through. Serve hot, warm, or at room temperature with rice or roti, any dal, Sambar/Rasam or curries and a bowl of plain yogurt. Linola gave me a bag of "Indian beans" saying that she did not care for them. Being the frugal person that I am, I could not bring myself to chuck it and forget about it. The package had the name "Surati Val". I have cooked and eaten many a bean from the familiar Toor, Urid, Chana, Mung, etc to exotic ones such as Peruvian or Scarlet runner beans. So trying another bean did not daunt me in the least. I soaked them overnight first. Then I cooked them with the idea of adding them to cabbage curry; took one little nibble - WOW! did they taste horrible! As I was headed to the compost bin thinking that Linola was right after all about these beans, a brilliant idea - in retrospect of course :) - flashed through my mind to remove the skins. So, instead of tossing the whole mess, I gave them another chance. I just simply but firmly squeezed the beans one by one between thumb and forefinger and the skins came off pretty easily. I realized that these were in fact none other than the 'Mochai' beans used in South Indian cooking. Removing the skins transformed the pretty horrible tasting things into delicate taste sensations! They even looked better! The rest is history.... it was a wonderful curry and we ate every last speck of it. Dolichos lablab (botanical name), has many common names including Hyacinth beans, Val (Hindi), and Avarakai - Mochai when dry - and (Tamil). They are cultivated in many areas of the world not only as a food source for humans or as fodder for animals but also for the fragrant flowers (reason for the name hyacinth bean) and the vigorous vines. There as two varieties - purple and white. I saw them growing in Thomas Jefferson's garden in Monticello and have wanted to grow them in my garden ever since! 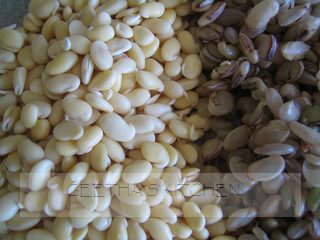 Some sources cite that the dry seeds are poisonous when eaten raw; these beans have been eaten for a long time in many cuisines of Asia and Africa and as far as I know no one eats them raw intentionally. According to many sources the young leaves are edible raw, but the mature leaves, pods, and tubers should be cooked first. The Dolichos pods are similar in appearance to pea-pods and are called Avarakai in Tamil. As far as I know only the pods and dried beans are eaten in India. The young pods (avarakai) are cooked like green beans; the seeds/beans (Mochai or Val) are soaked and skinned before incorporating into recipes. I have eaten them steamed, stir-fried, or boiled in various recipes. Here is the recipe for Cabbage Thoran with dry Mochai/Val Beans. Enjoy! Sort the beans and discard stones, discolored beans or other debris. Wash well and soak for several hours or overnight in abundant fresh water to cover. Drain (set aside for a day or two to sprout if you wish) and simply squeeze the soaked beans to remove skins. Discard the skins. Cook the beans in a little fresh water until tender but not mushy. Drain the cooking water and set aside until needed. Finely shred or chop the cabbage. Break the red chili into two pieces and shake out and discard the seeds to reduce its spiciness. Coarsely crush the cumin seeds and red chili in a mortar with the pestle then add coconut and crush to mix well. Set aside. Heat the oil in a large skillet or kadai (Indian wok) and add the whole red chili, mustard seeds and urad dal. Cover and cook until mustard seeds slow down popping and the dals are pinkish. Quickly add the asafoetida if using and the curry leaves. Be cautious when adding curry leaves -they tend to sputter and spatter; so cover the pan quickly. Stir for a few seconds until curry leaves are softened slightly. Stir in the shredded or chopped cabbage, turmeric, and the salt. Cook stirring frequently until the cabbage softens - about 7 to 10 minutes. Stir in the cooked beans and the coconut mixture and cook for a few more minutes - until heated through. Serve hot with rice or chapati and any dal or Sambar/Rasam for a simply delicious meal. Enjoy! !